Akwaaba welcomes community support. Become a sponsor, and we can display your name or business name here, along with a small advertisement or link to your site. Sponsor art and culture in our community today! 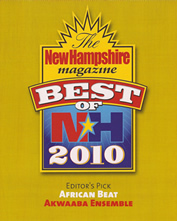 Theophilus Nii Martey’s profile at the NH State Council on the Arts is available here.